The Book of Daniel tells us that three Jewish nobles – Shadrach, Meshach and Abednego – were forced to enter the fiery furnace of King Nebuchadnezzar, after refusing to forsake their religion and worship the Babylonian gods. And so it is appropriate that a set of triplets – born in 1811 into the tough Nottingham slums behind Long Row – should bear the names of these three holy figures. Inner city Nottingham in the early part of the 19th century was not an easy place to live. The industrial revolution was in full swing but still the tightly packed slums of Sneinton, Nottingham – where the three brothers grew up – were hotbeds of crime, death and disease. Widespread rioting in the early 1830s threatened to tear the city apart, while a cholera epidemic in 1833 claimed the lives of 330 people. 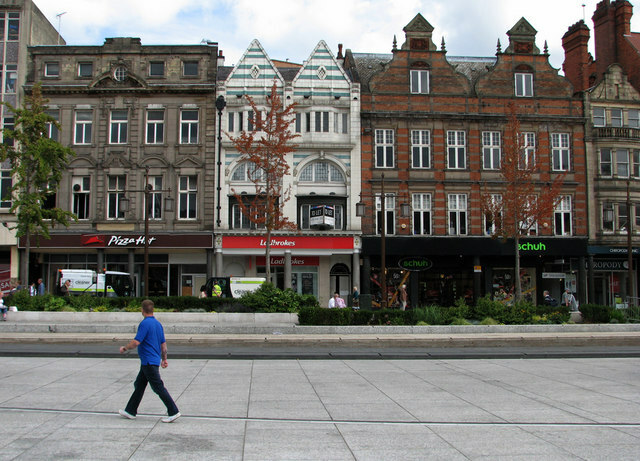 Nottingham would not have a reliable water supply until 1880. The front of Long Row today. It was behind here that Thompson and his brothers were born. Despite – or maybe because of – this hostile atmosphere, it soon became apparent that one of the triplets was a promising young sportsman. 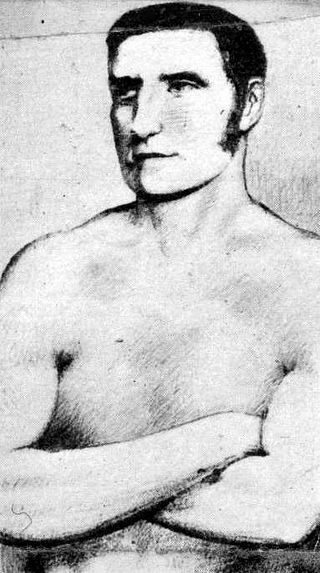 William Abednego Thompson – affectionately known as Bendigo – was well built and famed for his strength, and soon began taking part in prize fights in an effort to earn a little money. He also took up bets wherever he could, once winning a wager by hurling a brick over the River Trent. Bendigo – now nicknamed Bendy, thanks to his agile fighting style – was a popular pugilist and drew large crowds. He was famed for insulting his opponents as he fought them, distracting them with rhymes and verse and then felling them with his powerful left hand. Maybe his most enduring rivalry was with Ben Caunt, a fighter from the Nottingham suburb of Hucknall. Bendigo's bouts with Caunt were marked by dirty tactics and brutal fist-work from both parties. "Bendy", displaying his famous southpaw stance. As well as a slew of belts and cups, Bendigo also accumulated rather a lot of nicknames. As well as "Bendy", people began referring to him as "The Nottingham Jester", a name which hints at his popularity with the fans, if not with his fellow fighters. But such a tempestuous lifestyle was not sustainable, and as his advancing age forced him out of the boxing ring, Bendigo turned first to drink and then to violence and civil unrest. He was hauled before a magistrate several times for being drunk and disorderly, and for his involvement with the gang the Nottingham Lambs. The Hermitage pub in Sneinton features a statue of Thompson on its roof. Appropriately enough given his biblical name, Bendigo was able to break the cycle and find god. He became a popular touring preacher, commanding the pulpit with the same ferocity with which he struck his opponents in the ring. A fascinating and varied life came to an end on August 23rd 1880, when Bendigo fell down the stairs of his home in a suburb of Nottingham, suffering a punctured lung. The outpouring of grief from the residents of Nottingham for one of their fallen sons was immense, and some sources say his funeral procession was over a mile long. Nowadays, little is left of the Nottingham that Bendigo was born into. 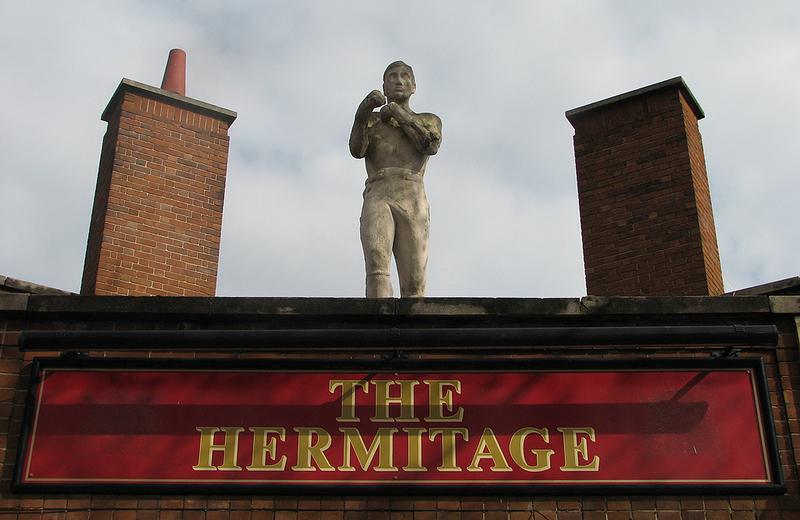 Change came and it came at a pace, and now the city is almost unrecognisable, but its legends remain. 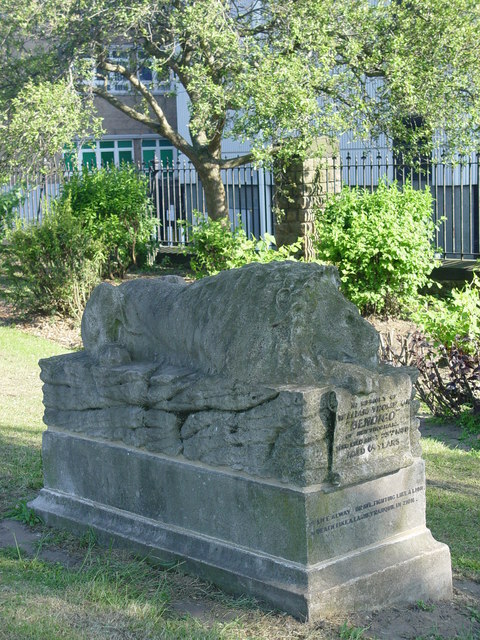 Those who want to go on the trail of William Thompson's memory can visit his monument in the Bath Street Rest Gardens, or visit Bendigo's Ring, a small copse of trees in the Bestwood area of Nottingham that this fascinating man would frequent in his later years. In many ways, the story of William Bendigo Thompson mirrors that of the development Nottingham itself – great, powerful, flawed and sometimes violent, but always proud. Let's try to keep the flame alive.